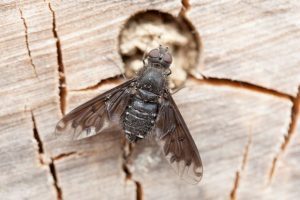 Buglife member, Rob Mills, has photographed a spectacular Black Bee-fly, never before seen in Britain sitting on a bee hotel in his garden near Cambridge. The scientific name Anthrax anthrax translates as black black. The body is black, as are the wings apart from a clear zone at the apex and around the hind margin. Unlike the bee-flies seen in gardens in the spring, it does not have a long proboscis but it still has the characteristic delta-wing pose when at rest. In the 1880s the Black bee-fly was reputedly found in Leicestershire but this has been considered a likely mix-up in labelling with specimens taken elsewhere in Europe. The bee-fly larvae live in the nest cells of mason and leaf-cutter bees, just the sort of bees which benefit from bee hotels. The growing popularity of bee hotels in parts of Western Europe has enabled this bee-fly to become more frequent.